A lot of people use the “chance of being struck by lightning” to sound like it is about as likely as winning a lottery. This is really a dangerous way to think of it. 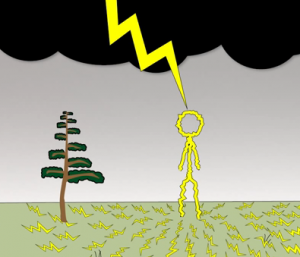 The reason that few people are struck is that few people are outside when thunderstorms occur. If you are in an open field when a thunderstorm forms, it is VERY LIKELY that you will be struck and killed. It is easy to think that when a thunderstorm approaches you will just go inside your car or a building. But when you are doing a lot of outdoor activities you will find yourself far from any kind of shelter. This happened to me and three of my sons while we were mountain biking. It was actually pretty scary. We did what the video says and crouched down and waited it out.